Shows: Winnie the Pooh: A Valentine for You, A Winnie the Pooh Thanksgiving, My Friends Tigger & Pooh. 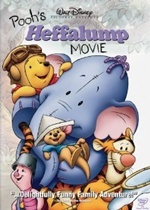 Movies: Piglet's Big Movie, Winnie the Pooh, Winnie the Pooh: Seasons of Giving. Games: Winnie the Pooh Toddler, Winnie the Pooh Preschool, Winnie the Pooh & Tigger Too Animated StoryBook.